Question: "What should be the focus of Christians on Thanksgiving?" 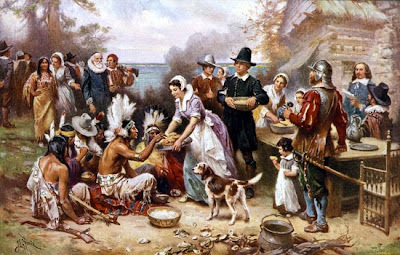 Answer: The original thanksgiving celebration was held by the Pilgrim settlers in Massachusetts during their second winter in America in December, 1621. The first winter had killed 44 of the original 102 colonists. At one point their daily food ration was down to five kernels of corn apiece, but then an unexpected trading vessel arrived, swapping them beaver pelts for corn, providing for their severe need. The next summer’s crop brought hope, and Governor William Bradford decreed that December 13, 1621, be set aside as a day of feasting and prayer to show the gratitude of the colonists that they were still alive. Scripturally, we find things related to the issue of thanksgiving nearly from cover to cover. Individuals offered up sacrifices out of gratitude in the book of Genesis. The Israelites sang a song of thanksgiving as they were delivered from Pharaoh's army after the crossing of the Red Sea (Exodus 15). Later, the Mosaic Law set aside three times each year when the Israelites were to gather together. All three of these times [Unleavened Bread (also called the Feast of the Passover) (Exodus 12:15-20), Harvest or Pentecost (Leviticus 23:15-21), and the Feast of Ingathering or Tabernacles (Leviticus 23:33-36)] involved remembering God’s provision and grace. Harvest and Tabernacles took place specifically in relation to God’s provision in the harvest of various fruit trees and crops. The book of Psalms is packed full of songs of thanksgiving, both for God’s grace to the Israelite people as a whole through His mighty deeds, as well as for His individual graces to each of us. "Rejoice always, pray without ceasing, in everything give thanks; for this is the will of God in Christ Jesus for you" (1 Thessalonians 5:16-18). Of all of God’s gifts, the greatest one He has given is the gift of His Son, Jesus Christ. On the cross of Calvary, Jesus paid our sin debt, so a holy and just Judge could forgive us our sins and give us eternal life as a free gift. This gift is available to those who will call on Christ to save them from their sin in simple but sincere faith (John 3:16; Romans 3:19-26; Romans 6:23; Romans 10:13; Ephesians 2:8-10). For this gift of His Son, the gift which meets our greatest need, the Apostle Paul says, "Thanks be to God for His indescribable gift!" (2 Corinthians 9:15).